Update: Don't know how I forgot this the first time, but you've simply gotta check out Jason Liebig's awesome Wishbook Web. Warning: Be prepared to spend hours -- he has entire catalogs from our youth online. Do kids even use Christmas catalogs any more? Or do they get all their gift ideas from TV and the Internet and, I dunno, random texts from online strangers. We LOVED our Christmas catalogs. Wards, Penneys, whoever...we treasured them the way I imagine Laura Ingalls Wilder treasured a new book in the town library or something. Forget the clothes, forget the auto parts and furniture and towels, we found that index right away (the cover always said "index on page whatever" to help us get there ASAP) and went zooming straight to the toy section. I don't know about you, but I read through the entire toy section every holiday season. Multiple times. I never just stuck to the toys for my age at the moment or the ones recommended for girls. Baby dolls, Barbies, action figures, cars and trucks, microscopes and microphones, chemistry sets, I was intrigued by them all. You could tell what movies were hot (Star Wars! ), which trends were taking over (home video game consoles--Atari!) and which franchises were getting reborn (will Strawberry Shortcake ever die?). One of my favorite sections was the make-it-at-home food machine-toy sections. Easy Bake Ovens! Snoopy Sno-Cone Machines! There were others, but we never knew anyone who had them. I realize today that this fascination may have indirectly led to this site, and our upcoming book. No toy was uninteresting to me, even if only to wonder why someone would covet it. We dogeared pages in the catalogs, starred items we wanted, circled them, put them on a list. But it didn't, in the end, matter if we got them all, or really, any. The hours spent curled up with the catalog were like a present in itself. Plaid Stallions has some of the most awesome vintage toy catalogs online if you want to relive those childhood days. There are also some relevant Flickr groups. 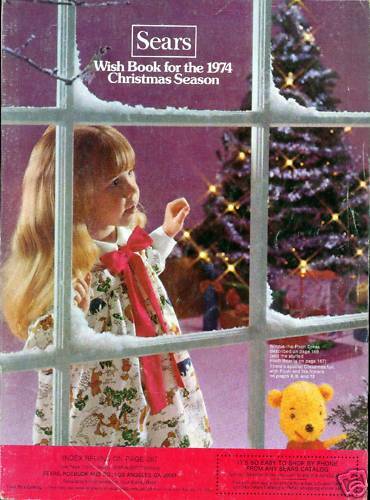 I absolutely remember the Sears Wish Book that came around Octoberish. In fact, I think I recognize that very catalog you've got pictured! My mom got the Spring/Summer, Fall/Winter and Christmas catalogs from Sears and Montgomery Ward, and later Penney's too. We always knew Christmas was coming soon when the catalogs came and spent hours lying on the floor together looking, circling and making lists, just like you. The Wish Book (toys only! )was like a present in itself! I wish they were still around. It's sad that they were a fun traditional part of Christmas for us that my own kids know nothing about. If anyone has and is willing to scan/post Pages 18-19 of the Montgomery Wards 1961 Christmas Catalog, please msg me. We are looking for a certain picture of a red suited, flattish face, stuffed lion. We don't think it was a Pajama Bag but its possible. Oh what memories the Toys in these bring! Does anyone know if the Fall/Winter Catalogs had many toys like the Christmas Editions?